Margaret Montcrieffe was personified by couture artist Camilla Huey among nine women in the life of Aaron Burr. The exhibition and film to preview at the Bard Graduate Center on May 7th and will premiere on May 14th at the Morris-Jumel Mansion. Burr’s biographer and editor, Matthew L. Davis, supposedly a friend and ally, contributes to the slander of Burr by the burning of correspondence with women he deemed “of no very strict morality,” while stridently impugning his once close friend as “licentious in the extreme, and regardless of consequences in the gratification of his desires.” Davis destroyed the evidence that might have exonerated Burr. Margaret herself disagrees. In her 1794 The Memoirs of Mrs. Coghlan, the beautiful girl Burr suspected of spying for the British through “the language of flowers” regards herself less a “victim of seduction” than a teenager with a crush. Ms. Moncrieffe is coy regards the dashing “American Colonel” who “plighted my virgin heart.” Margaret was sent out of both strategic military position and Burr’s embrace. Still, she credits him with her rebellion against “the barbarous customs of society” that kept them apart. This piece contends with the condition of a fourteen year old girl having a trippingly light and halcyon experience amidst a colonial war while painting pictures of flowers for her own father while losing her “virgin heart” to yet another father figure, that of Burr. The light blue damask corset cradles a first edition of her “memoirs”, the vehicle through which we had first become familiar with her life. Looking into the book, rising from the pages, are the florid, watercoloured pages. This portrait was continually worked on after exhibition, carving the form into the curved finished shape, the cut away under the hip filled with a peplum beneath the corset. The bones are concealed within the velvet ribbons as casings over the seams. The edges and lacings are traced with a shredded crimson silk and under the book is an iridescent silk square drawing the viewer’s eye back, heating up the original bibliographic material. Daughter of the Late Major Moncrieffe, J. Fellows, New York, 1795. Burdett, Charles. 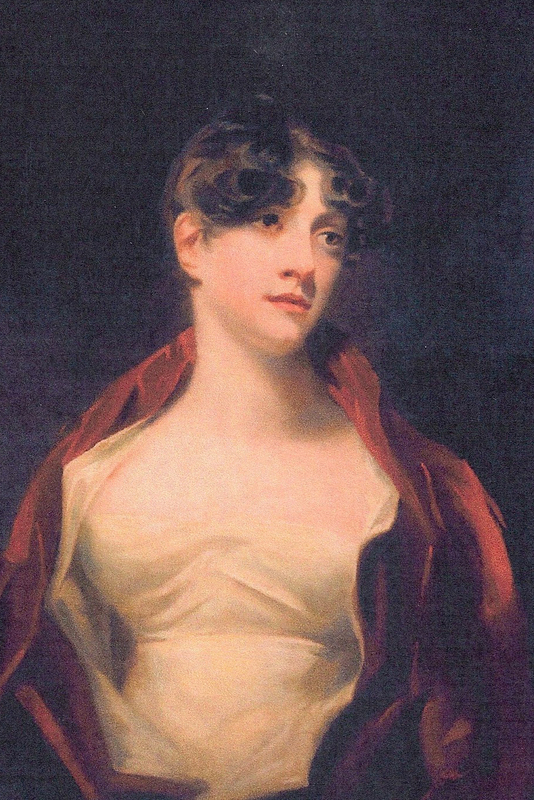 Margaret Moncrieffe, The First Love of Aaron Burr. New York, H.W. Derby, 1861. Coghlan, Margaret. Memoirs of Mrs. Coghlan, (daughter of the Late Major Montcrieffe,): Written by herself and dedicated to the British nation; being interspersed with anecdotes of the Late American and present French war, with remarks moral and political. London: J. Lane, 1794.